REMEMBER, MAN, you are dust and to dust you shall return. 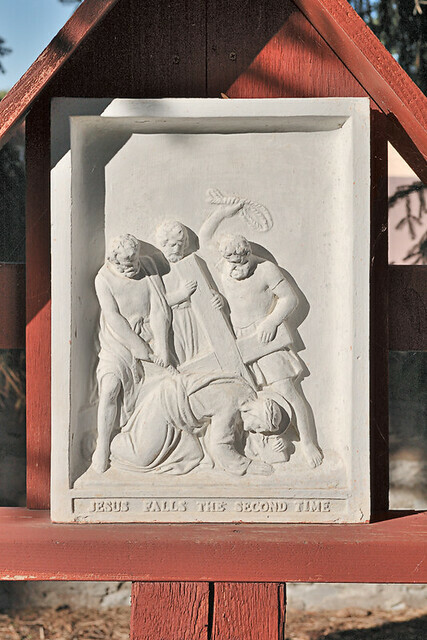 Jesus falls a second time, at the Little Sisters of the Poor, in Saint Louis. Whenever the Holy Mother Church apparently abandons something good, the secular world takes it and perverts it. We have seen this with sacred music — now heard in concert halls and sampled in popular music — and in metaphysics, taken over by the New Age. The imagery of authentic Catholic liturgical art, such as the Gothic style, has been given over to profane use. In current Catholic disciplinary practice dating from 1966, there is no need for a carnival, for we do not have significant fasting and abstinence from meat products unlike former days. And so, carnival has been taken over by the secularists, where in many places it has become a non-religious festival of excess and vice. Authentic carnival practices are rare, and typically are found only in rural areas. See the article Carnival and Lent. Many accuse Catholicism of taking pagan festivals and making them her own, but that is precisely what the accusers do to Catholic festivals: taking them as their own and making them pagan, which is what we see with Christmas and most other major Christian holidays. We need to understand that Lent is a time of purification, of spiritual warfare, of denying the self, in imitation of Christ’s 40 days in the desert, of Israel’s 40 years in the wilderness, embracing the suffering of Christ’s passion in acknowledgement of our sins. In particular, Lent is a time for prayer, penance (often by fasting), and almsgiving. Many have difficulty in prayer, but the simple solution is to just do it, and it will become habitual. According to the Oxford American Dictionary, penance is “a voluntary self-punishment inflicted as an outward repentance for having done wrong”. Unfortunately, many Americans feel that they are good people, and so don’t need to do penance. Likewise, fasting in and of itself as a method of disciplining the body is not seen as a good thing, and many people (if they can afford it) choose cosmetic surgery to replace self-discipline. Almsgiving is now seen as something that the government does, and we are even told to not give anything to panhandlers. Overcoming contemporary culture is very difficult, but we should at least try, and be open to grace. Psychologically, our era is a time of unprecedented suffering, particularly in wealthy countries. But this is not generally physical suffering (although that is inevitable), bur rather spiritual suffering. Depression was once very rare but today is common, and it is far worse for a person than physical suffering, and it often manifests itself in hypochondria. From a purely human standpoint, embracing bodily suffering, and transfiguring it, is the best method of overcoming this kind of spiritual suffering, and so Lent has a good purpose that even secularists could understand, if they weren’t hell-bent on imposing spiritual suffering. And so it is good practice to replace spiritual suffering by physical suffering via self-denial. Even long before I became Catholic, I noticed that Catholics tended to handle suffering better than others. This is a kind of ‘cool,’ similar to the now nearly-lost English “stiff upper lip,” the kind of disregard for the self that is seen in the best moments of chivalry and valor. This is not quite stoical resignation (although it is close to it), but suffering can be endured joyfully — and that is what we are commanded to do. "Almsgiving is now seen as something that the government does, and we are even told to not give anything to panhandlers." While almsgiving should certainly NOT be left exclusively or primarily to the government, and there is greater need for personal charity, is it not true that many if not most panhandlers are simply taking advantage of the generosity of others to feed drug or alcohol habits, or mental illnesses? The few dollars I give to a panhandler may enable him to eat, it is true, but it might also enable him to yield to an addiction and purchase the "fix" that results in his death. I struggle with this question frequently as panhandlers are common in my city and I have been approached by them occasionally. I remember all the old stories of saints who gave to beggars and thereby helped Christ without knowing it; but I also remember horrifying news stories of young men and women who have succumbed to heroin or crack or meth addiction and obtained money to feed their habit through panhandling. It seems to me that there is not a moral obligation to give directly to panhandlers, as there are other sources of assistance available to them (via private charities and other agencies) that were not available in the time of Christ or in the ancient/medieval eras when begging was often the only recourse the poor had. If I can, I try to point these people to somewhere they can obtain assistance, although they usually go on to claim that the facility is closed or won't take them, etc. So I'm not so sure that the common advice against giving to panhandlers is rooted entirely in lack of compassion or charity. It may simply be prudence. If I were poor and living rough on the street, I'd be extremely grateful for some money to buy a beer, to be able to drown my sorrows for a few hours. Are you cruel enough to deprive me of the only tiny shred of happiness I am able to enjoy in my bitter, degraded life? These men are without hope, without a future in this world. Our laws are so rigid that it makes it largely impossible for a man like that to legally obtain sustenance income other than from begging, and even makes charity or government welfare hard to obtain. It is simply legally impossible to give a man a bed and food in exchange for, say, sweeping the sidewalk or keeping an eye out for burglars. Yeah, I know all the excuses. Instead, I think that there are people, black in their hearts, who want these men to be homeless on the streets, who want them to be aggressive panhandlers, who want them to be excluded from earning even a tiny income by honest means. This blackness of heart can be found in either the Puritan notion of the "unworthy poor" or in the marxist approach which turned these men out onto the streets as part of a strategy of class warfare. I remember the time when mental institutions were radically reformed, causing a huge homeless problem within the course of a few years. Not that I agree that the old system was good, but few have questioned the wisdom of the present reform.